Now, Maurice has a lot to be philosophical about. For one thing, there isn’t much of him left, and that puts a man in a certain frame of mind. I had watched the Green Man take almost everything from him except me, his right eye; I had been left in his skull in an unexpected gesture of generosity, even though Maurice had bet me and lost me along with his left eye fair and square. Now, I understand that this admission may raise more questions than it answers. For a start, how can an eye tell a story like this? Well, you might wonder, but let me ask you this - who is better placed to tell a tale about a man if not the very witness of his troubles, his actual eye? Everything that transpires, I am the first to see it. I’ve even got the drop on the brain, and in any case, he ain’t talking. Besides, I have a right to my opinions, just like any other part of the body; perhaps more so, given that I have the window seat. You wouldn’t get this story out of his spleen or liver, that’s for sure - notwithstanding the fact that they are in a bucket at the Green Man’s place and won’t be telling anyone anything any time soon. So as far as I can tell, it’s up to me. And here I am, spinning around his eye socket in his skull, his tar black skeleton wearing a flopping pair of boots, a shirt wrapped around his empty ribcage and pair of discoloured pants flapping loosely about his stripped leg bones. A grey fedora sits upon Maurice’s bared skull, affording me some shade; handy without eyelids. He pulls it down low over his brow in what I assume is a vain attempt to pass as normal. After the darkness of the club, the midday sun is bright. It’s pretty clear that Maurice is not sure where he should go, or what he should do. He doesn’t have any money on him, or for that matter anywhere else in the world: the Green Man has cleared him out. In any event it seems unlikely that he would have been able to hail a cab in his current state, even with the hat helping to conceal his grisly deaths-head. With this in mind, there’s nothing left for him but to walk us the twenty blocks to Ramona’s place. Three blocks along, the first dog starts following us. It’s a scruffy mutt, clearly more than a little interested in this walking bag of bones, and before long a mate has joined it in pursuit, a little yappy thing with a springy tail. If our entourage grows any more, I think, it is going to make it difficult to stay inconspicuous. 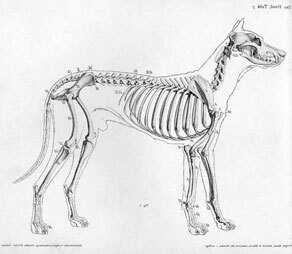 Unfortunately, grow is precisely what it does: around Walker Street a large black dog gets the scent of the exposed skeleton, and a block later it’s joined by a well-groomed Labrador that has evidently escaped doggy detention. Maurice has no choice but to power along with all four dogs trailing in his wake, a stiffly shuffling scarecrow attempting to keep one step ahead of an apparently devoted following. I suppose he’s feeling pretty self-conscious, although he doesn’t say so; and wanting to close the distance to Ramona’s flat in the quickest time possible, Maurice picks up the pace. Not far along, he walks straight into a pedestrian who has unfortunately loomed up on his left, eyeless side. Even I didn’t see that one coming. ‘I’m terribly sorry’, he says – or attempts to say, but not having lips meant the words come out wrong, little more than a rasping bleat. Recovering his balance he turns so I can get a look at the man, whereupon we discover to our horror that we have walked right into a cop. Dumbfounded, Maurice shakes his head. ‘No’, he said, although it sounds more like ‘oh’. ‘And are you aware, sir, that those dogs should be on a lead?’ The dogs are sitting patiently behind us, wagging their tails. Not wanting to complicate an already baffling exchange, Maurice nods, while I goggle at the man in my lidless way. ‘Thanks’, says Maurice, although it sounds more like ‘anks’. With that the policeman nods once, sharply, and simply walks away, leaving us standing in the street. Maurice half-heartedly attempts to shoo the dogs back with his skeletal right hand, achieves nothing, and so goes on his way. After a staggering but thankfully uneventful further walk we finally reach 13 Tower Street, the building where Ramona has her flat. He buzzes her number, and in short order we are in the foyer, the disappointed dogs left milling on the stoop. ‘Phew’, he might have said, but as it is not possible to say ‘phew’ without lips, he contents himself with merely thinking it, and climbs the stairs. Having little choice in the matter, I climb them with him.